Manelgalla village is situated in the dry zone in the Wellawaya District of Sri Lanka. When Trustees first visited this location in 2016, the village people had to walk 3 kilometers on a daily basis to carry water from the river – water that was polluted and unfit for consumption. The river water contains chemicals and sand that are washed down into it. In the dry season, which may last 7 months, there was no water at hand within the village. On our first visit, we saw a deep hole in the land of the village with a little ground water. It was explained that this lasts for a few months in the year and then dries up. The water source is owned by a gentleman named Mr H.G.Priyantha. 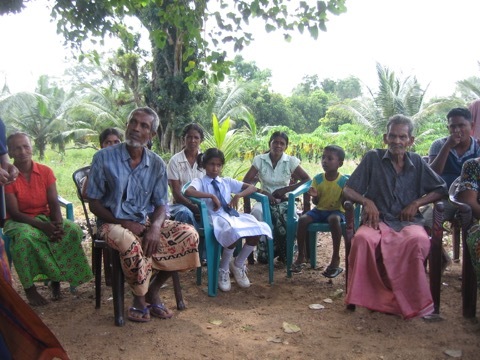 The village people requested Project Sri Lanka to enable the containment of this water source with an appropriate retaining wall and the transformation of this into a fully functioning agro-drinking well. Project Sri Lanka agreed to support this project and the well was constructed during 2016 with a great deal of basic labour being given by the people of the village. The new well has transformed village life. Not only is clean drinking water available throughout the year, but also water is now available for agriculture so the people can grown crops for their own consumption and for income generation. Crops grown in Manelgalla include peanuts, chilies, papayas, coconuts, mangoes, limes, lemons, beans and red onions. In 2018 Trustees returned to this village where the well had been ‘opened’ in 2017. The well has water despite recent severe droughts and has a functioning pump system. A good crop of aubergines was being watered. Other crops seen included lime, mango, papaya, coconut and jack fruit. The villagers made it clear that this well had had a hugely important impact on village life and income generation potential.